Welcome to Chapter Six of our course on creating your own interactive website! In Section 6.1, we will review the many different types of menu item links available for your Joomla website – and what each type is used for. In Section 6.2, we will describe how to add links to the categories we have created in our Category Manager. 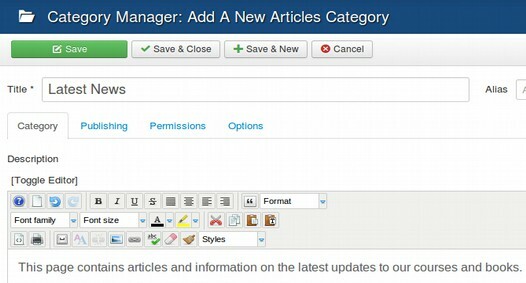 In Section 6.3, we will describe how to add links to the articles we have created in our Article Manager. In Section 6.4, we will explain how to create navigational links inside of your articles. Links and Page Breaks make it easier for visitors to navigate your website. A well organized navigational system can also increase your Google page rankings. This section has step by step instructions for dividing and connecting pages using the Joomla Page Break function and the JCE Editor Linking function. Linking is one of the primary methods used on the internet to convey and share information. Menus are simply a series of organized links to related pages with the menu items being the actual links. In this article, we will review several additional linking methods including READ MORE, PAGE BREAK, INTRO IMAGE AND TEXT, and adding internal or external links to text and/or images in articles and/or modules. A line is then inserted into the article. Save the article and then view the site to make sure the Read More link is displayed properly and takes you to the intended page. When you create a Joomla article for the front page or blog view and use the Read More option to split the article into two sections you will find the Read More link includes just the text "Read More" rather than the title of your article. To help search engines like Google understand what the article is about plus improve the click through rate from both search engines and visitors, we recommend you change the read more link so it matches the title of your article. For example, if you have created an article titled "Benefits of Joomla for Business Websites" then the read more link would be "Read More Benefits of Joomla for Business Websites." 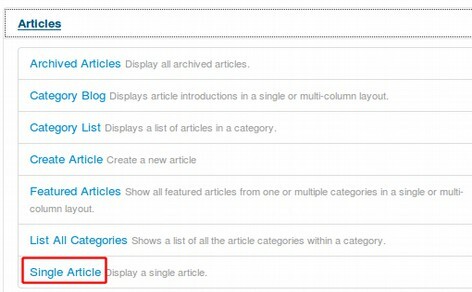 Enter the title of the article and assign the article to a blog category. Select the Read more button located at the bottom of the editor. In The Alternative Read More Field enter either the name of the article or type in Read More or Learn More, then type in the name of the article or whatever else you want to use for the button name. Select the SAVE button and the new read more link will now be updated for this article. You can use different button names for different articles. It is sometimes useful to split a long article into shorter sections so the reader does not have to scroll down the page just to reach a particular section in the article. 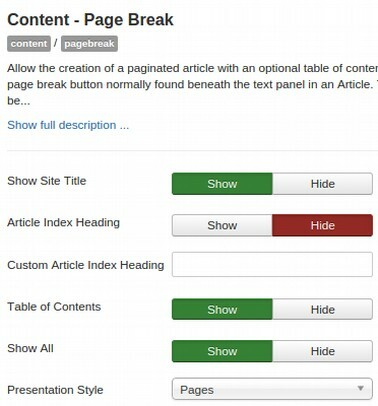 Using a Page Break also creates a table of contents for your long article, with the page tab entries being the Page Titles that you enter for each page. You have to decide how long each page will be but the table of contents includes an option to view the whole article, so a reader is not restricted to viewing your article one page at the time. In addition to displaying the Table of Contents, each page will show a Previous and Next navigation button at the bottom of the page. Articles which have many pages and many clear dividing points are ideal candidates for inserting page breaks. For example, our Article 2.2 Getting Started with your Joomla Website is over ten pages long and has an introduction section followed by 10 steps. We will break this up with 10 page breaks. To insert a page break, go to the Article Manager and open up our long article. Then position the cursor where you want the first page to end and the first page break to go. Give the New Page a Title, then click Insert Page Break. The second field called "Table of Contents Alias" will be the URL for this second page and can be automatically entered by Joomla. This will insert a line into the text indicating a page break has been inserted. TIP: If you do not insert a title, Joomla will simply list page numbers which will not be very useful either for viewers or search engines, so it is recommended that you take the time to give each new page a short title based on the primary subject of that new page. Keep clicking "Pagebreak" and typing in titles until you have split this article as many times as you wish. Each time you click “Pagebreak”, you should see a grey line across the page. When you're finished, click Save and Close. Then visit the front end of your website and click on the article in the menu to open it. Show Site Title includes some of the article information in the page title. It is best to set Show Title to Show. Article Index Heading Setting this to Hide will hide the title that says "Article Index" by default. You can set it for Hide in order to save space.. Custom Article Index Heading means that you can change the text of the "Article Index" heading to anything you want. For example, you could change this to Article Table of Contents. Leaving this blank will display Article Index. Table of Contents generates the list of links in the article, the Article Index, on the page. Setting this to Hide would eliminate that list. So leave this set for Show. Show All controls whether the link to show the full article without page breaks is available in the Article Index. Leave this set for Show as some viewers prefer to see the entire article and scroll down rather than clicking on a series of pages. The style shown above is called the "pages" format. With some templates, you can also display page break information with a sliders format or a tabs format. With the Design Control template, the sliders format just put a series of links to the 10 pages at the bottom of the first page with Previous and Next buttons. The navigation is not very clear. The Tabs option did about the same thing. So we are better off staying with the Pages option as this will show the Table of Contents for all ten pages on every page being viewed. If you really would like a slider or tabs to display sub pages inside of an article, you can get these free tools from the Joomla Extension Directory. WARNING: It is not possible to edit page break titles once they have been made. To change this information, you have to delete the page breaks by deleting the inserted lines and start over. This optional feature for blog category articles allows you to have different text in the blog category view from the text that is displayed when you view the full item. The default content shows you the intro text in the blog category view and when you click the read more button you get the intro text and the full text. In some instances you may want to have a different image or text on the full article main page than the intro image and text that appears on the blog page. You can do this by setting the introtext to NO in the menu settings for the blog category settings. To set the Intro Text and Intro Images feature to display, go to the Article Manager and click on OPTIONS in the upper right corner. Click on the Editing Layout tab, then make sure Administrator Images and Links is set for SHOW. Also we must create a new blog category and a new blog menu item like we showed above for adding a READ MORE button if we want to use the Intro Text and Intro Images function on a page which is not already set in a category blog – or is not on the Home Page Featured Articles. To create your Intro Text and Intro Image, open a new or existing article which is set for our category blog category or featured articles. We will use a new article for our Home page called What is Joomla? To place this article on the HOME page, just changed Featured from No to Yes. Above the article editor is a tab called Image and Links: Click on it. Clicking on the Select button brings up the images manager where we can add an image from any folder. Usually, thumbnail images for articles are kept in a special folder called thumbnails. Thumbnails are smaller images used at the beginning of blog articles. If you want thumbnail images automatically made for you, by reducing regular article images then go to the Joomla Extension Directory. There are several free extensions which will do this. You can also add a caption and alternate text to display in only the blog Introduction. Then click SAVE and Close and View the article to see the result. An internal link is a link from one article to another article on your website. To add an internal link to an article, go to the Article Manager and open the article to the Article Edit screen. Then select the text or image you want to create a link for. Then click SAVE. Then View Site to check on the link to make sure it actually works. Then click SAVE and CLOSE. Linking to an image works exactly the same way. Joomla treats PDFs as if they were large images. So you add PDFs to the Media Manager just like you add images to the media manager. First, you create a folder to put them in (named pdf or downloads). Then you upload and organize your PDFs in this folder using the Upload tool in the Media Manager or your File Manager. You then add a link to a PDF the same way you add a link to any other text or image. First you type in the name of the PDF. Then you click on the LINK icon in the JCE Editor. Then you click to the link. Select the text or image that users should click on. Then click the Link icon to launch the Link Manager. The Link Manager will open a window. Click the Green Plus (Browse) icon. Or the blue button will take you to your Home computer were you can upload PDF files to this folder. After clicking on the PDF, click the INSERT icon. This will not only activate the link to the PDF, but allow the PDF to be downloaded. Then click Save and Close. The PDF can now be downloaded by going to the article and clicking on it. TIP: The problem with this simple method of linking a PDF to an article is that you do not get a count of how many times the PDF file was downloaded. Nor are you notified when the PDF is downloaded. We will therefore use a different component called Phoca Download to organize our PDFs into categories and keep track of how many times each PDF is downloaded. In the previous section, we described how to post Featured articles to your Home page, how to create a Category Blog Menu Item and how to create a Category list menu item. In this section, we will review the other two ways to display articles. These are two create a Single Article Menu Item under a Category Menu Item or create a Single Article Menu item and place it in the top level of our main menu. If a single article is not placed as a “Featured Article” on your HOME page and is not assigned to a Blog Category or List Category, it will need a Single Article Menu item in order to be viewed. Single Article Menu Items are generally not placed in the top level menu. In the previous sections, we set up the top level category blog and/or category list menu items in our main menu. We will now create menu items for single articles, or single pages, which we will then place under those top level categories in the Main Menu. This is done in addition to creating the category blog and/or list menu items. To create a Single Article menu item, click on MENUS, Main Menu to reach the Main Menu. Then click on NEW to reach the New Menu Item screen. Click on the blue Select button to open the Select Menu Item screen. Then click on Articles and select Single Article. This will return us to the Menu Item Edit screen. Click on the Grey Select button. This will take us to the Article Manager where we can click on the article we want to associate with this menu item. Note that we first need to make an article in order to select it. You can also give the menu item a title. This does not need to be the same as the title of the article. Ideally the title of menu items should be a shortened version of the title of the article so as not to take up too much space in the main menu or in a drop down menu. Below is what the New Menu Item screen looks like after selecting our first article and giving it a title. The final task is to place this article menu item as a child menu item beneath the matching category list menu item. This article is in a Category called 01 Startup. So use the Parent Item drop down arrow to select 1 START UP as the Parent Item. Here is what the right side of the New Menu Item screen now looks like. Click on the Parent Item Drop Down arrow. This will bring up all of your existing menu items. You can select any existing menu item to be a parent of any new menu item. It is however unwise to choose an Article to be a parent menu item of another article. Instead, it is much better to have categories be parent menu items of articles. The default setting is Menu Item Root. If you leave a new menu item with this setting, it will appear in the Main Menu as a Top Menu Item. For the above example, we have selected 1 STARTUP. The Menu Item for the article “Why Joomla is Better than Wordpress” will therefore be placed below the Category List Menu Item called 1 STARTUP. Placing an article menu item in the top level of the main menu is the least common option. The main exception to this is a Contact Us page. This page is so important that it is often placed in the Top Level of the Main Menu. To create a new Menu Item to place an article in the Top level of the main menu, first create a short Contact Us article. Then go to the Main Menu and click New. This takes us to the New Menu Item page. Click on Select to bring up the Menu Item Type screen. For menu item type, to display a single article in the Main Menu, click on Articles, then Single Article. This will take us back to the New Menu Item screen. For the Title of the Article, type in Contact Us (or the name of your Article). When you select the Single Article Menu Item Type, Joomla creates a new dialog box below the Menu Item Type box where you can select the article you want to link to this menu item. Click on SELECT which takes us to the Article Manager. Select your article. So far this has been exactly like the steps we used to create a Single Article Menu Item to place under a Category List menu item. The only difference is that this time we will place the Single Article Menu Item in the top level of the Main Menu. This is done by using Menu Item Root for the Parent Item. Here is our current main menu. Now that we have posted our articles and created menu items for them, in the next article, we will review how to divide and link web pages. In this section, we will describe three ways to display a new article and provide examples of each. The first way is to simply place the article on your Home page, which by default is a blog page. The second way places the article in a blog which is not on the Home page. The third way, category list, creates a table of articles assigned to that category. In section 6.3 we will review the other two ways which are to create links to your article in the Main Menu or in a drop down sub menu below a main menu item. We will start with the simplest way to display an article which is to view it on the Home page of your website. There are typically no “menu item links” to articles posted on your HOME page. For example, in Chapter 4, we posted a new article called Welcome to our Website. We placed this article on our Home page by clicking on the Featured box in the Edit Article screen and selecting Yes. We can place as many articles as we want on our Home page by selecting Features equals yes. To view a list of our Featured Articles, click on Content, Featured Articles in the Top Menu. We can change the order that these articles appear on our Home page by clicking on the Ordering label at the top of this table. Then use the arrows to move articles up or down on this list. We can also click on the Gold Stars to remove an item from the list of articles displayed on the Home page. The fastest way to display an article on your website is to simply put it on the Home page. But not all articles should go on the Home page. A Blog Category Menu Item is often used to create a “Latest News” page. The benefit of this menu item type is that any articles assigned to this category do not need separate menu items created for them. They will automatically appear in the Blog page. The Home Page is a blog page and the HOME menu item can be adjusted simply by going to the Main Menu and clicking on it. We can assign an article to the Home page blog simply by setting Featured to Yes. Before we can add an article to any other blog page, we first have to create a blog category with the Category Manager and then create a blog menu item for that category with the Main Menu Item Manager. Inserting a READ MORE link into an article is the same as inserting an image into an article. You simply place the cursor where you want the READ MORE line to go, then click on the READ MORE button at the bottom of the page. Whether there is a READ MORE link depends on how many articles are on a page and how long each article is. With four or fewer articles, you can probably have two to three paragraphs before the READ MORE link without the page getting overly long. 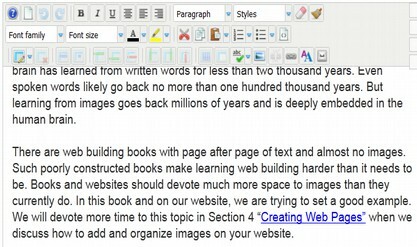 However with 5 to 8 articles per page, you may need to cut off each article after the first paragraph and first image. With more than 8 articles, you will generally be better off displaying them as a Category List rather than a Category Blog. Once you have added READ MORE buttons, click Save and Close. 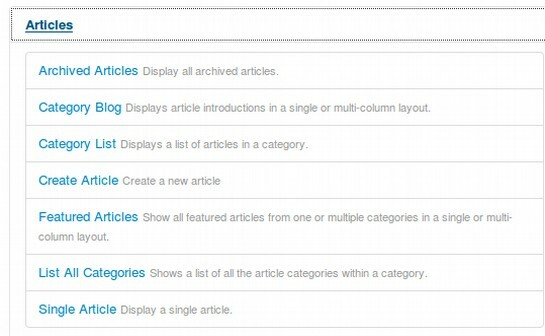 A category blog menu item can be used on any page where you want a group of articles all displayed on the same page. In other words, it can be used for any page you would like to format like the Home page. To create a Category Blog Menu Item, go to the Main Menu and click NEW to create a New Menu Item. This brings up the New Menu Item screen. Click Select to bring up the Select Menu Item Type screen. Click on Articles. Then select Category Blog. This will bring us back to the New Menu Item screen. However, it will also magically bring up a drop down list of categories allowing us to choose which category we want to use for our category blog. Select the Latest News category which we just created. Then type in the title of the menu item. If you type in the first letter, Joomla will suggest title names which you can click on. However, rather than calling the Menu Item Latest News, since there is a limited amount of room in the Main Menu, we will simply call this menu item NEWS. The above image shows a category blog menu item called NEWS being linked to a category called Latest News. Any articles posted in this category will be displayed on this page. There is no need to create a separate menu item for articles assigned to a blog category (although it is helpful to make it clear to your readers that there is more than one article under this menu item). Blogs are typically posted in the Top Menu position in the Main Menu. To put it in the top main menu, its Parent Item will stay as Menu Item Root. To give the menu item a color, click on the Link Type tab, then type in bluegreenstyle in the Link CSS Style box. Then click Save and Close and View Site to check out the new menu item in our main menu. Click on NEWS to view our Latest News blog page. A simple way to create a personal or Latest News blog that looks and acts similar to a Wordpress Blog is to set up a Blog category main menu item. 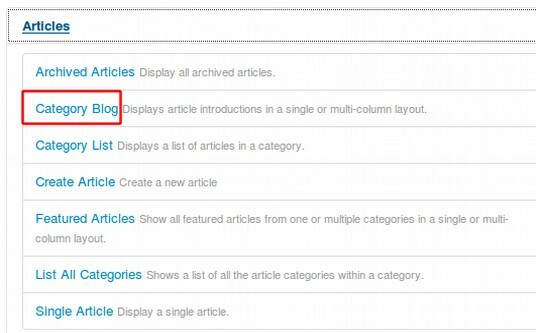 Then assign blog articles to the blog category. Finally, get a “Comments” extension from the Joomla Extension Directory and assign it to all of the articles which are posted in the Blog Category you created. We will review how to do this in our chapter on Social Web Tools below. 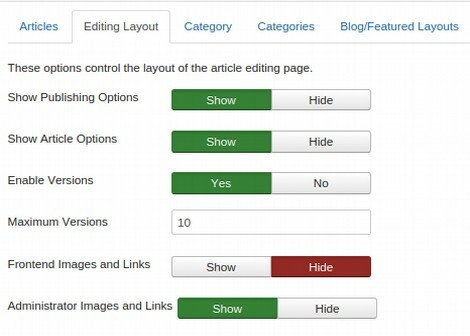 Blog Layout Options, set either globally with the Article Manager or individually with the Menu Item Edit screen, control the appearance of the blog layout page. To adjust the layout with Global settings, go to your Article Manager and click on Options in the upper right corner. Then click on the Blog/Featured Layouts tab. Blogs are often displayed as two or three columns of articles. But this makes them very difficult to read. We will therefore use a single column and have 9 leading and intro articles which viewers can see by scrolling down the page. Below this, we will have links to up to 9 more articles. Then click Save and Close. 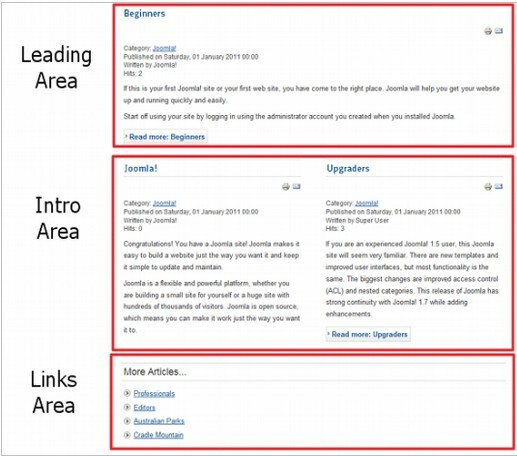 To get a clearer idea of what this means, a Blog Layout in Joomla has 3 main areas: Leading, Intro, and Links. These are shown in the diagram below. Articles in the Leading Area display in one column, using the full page width. Articles in the Intro Area may display in one, two, or three columns, depending on the Columns setting. If an Article has a "Read more..." break, only the text before the break (called Intro Text) will display, along with a "Read more..." link. # Leading Articles. Number of Articles to show using the full page width. # Intro Articles. Number of Articles to display on the first page of the blog after the leading Article. The order in which the articles are displayed is determined by the Article Order parameter below. # Columns. The number of columns to use in the Intro Text area. This is normally between 1 and 3. If 1 is used, the Into Text Articles will display using the full width of the display area, just like the Leading Articles. 1 is the recommended setting. # Links. The number of Links to display in the 'Links' area of the page. These links allow a User to link to additional Articles, if there are more Articles than can fit on the first page of the Blog Layout. This is a reasonable alternative to Pagination. There are more settings that can be selected for each blog menu item after it is created. For example, go to your Main Menu and click on your HOME menu item. It opens to the Details tab. But click on the Layout tab and you will see not only the Options listed in the Options tab earlier, but also a way to set the Article Order (which should be set for Featured Articles Order) and a way to set Pagination (which is typically set for Auto). If you want to hide the title of the Home page, then click on the Page Display tab and set Show Page Heading to No. You can make similar changes to your Latest News blog by clicking on its menu item and then selecting the tab you want to make changes on. Article Order This is the order of articles in this Layout. Choose Article Manager Order. 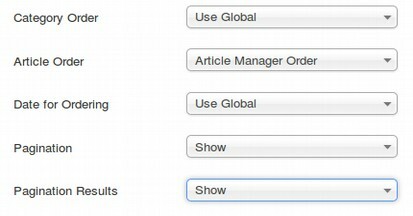 With this option, articles are ordered according to the Order column entered in the Article Manager. This option gives you the most control over article ordering. Pagination for Blog Articles. This determines whether Page Links appear on your blog pages. Pagination provides page links at the bottom of the page that allow the User to navigate to additional pages. These are needed if all of the Blog Articles will not fit on one page. An example is shown below. Select Show: This option will show pagination links if they are needed. Pagination Results. Hide or Show the current page number and total pages (e.g., "Page 1 of 2") at the bottom of each page. Now that we have a category blog in our main menu, we will next see how to add some category list menu items to our main menu. Blog Menu Items are a good way to post a small number of articles in a time series. However, for posting a large number of articles that are all in the same category, a category list is more efficient. Viewers can click on articles in the table without having to scroll down the page to find the article they want. The first step is creating a “Category List” category with our Category Manager. 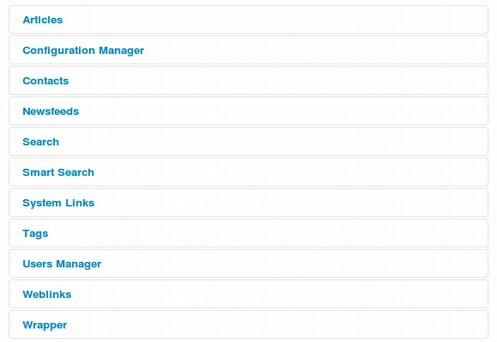 There is no difference between a blog category or a list category as far as the Category Manager is concerned. Any category can be turned into a blog or a list depending on how it assigned with in the Menu Item Manager. Hopefully, we created all the lists we needed in Chapter 4.1 when we made our Table of Contents. We can always add another category if needed. As we create new articles, in the Article Edit screen, we can assign each article to one of the categories we have created. This can be either a list or blog category. The only difference is that with a list category, there is no need to insert a READ MORE link after the introductory paragraph. 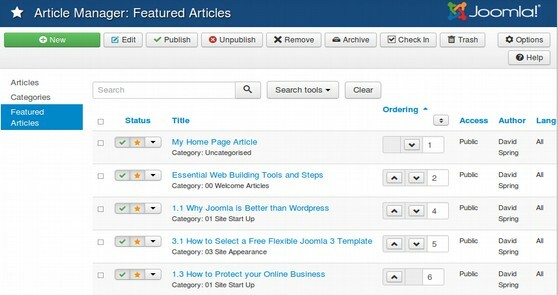 We previously discussed how to use categories to organize your Joomla articles and images. We should apply this same Category structure to organize our Main Menu. The purpose of this organization is to help readers navigate our website – just as any good book includes a Table of Contents in the front to help readers understand where things are placed in the book. To create a new category list menu item, go to the Main Menu and click on New. This brings up the New Menu Item screen. Then click on the blue Select button to bring up the Menu Item type selection screen. Click on Articles. In the previous section, we selected Category Blog. In this Section, we select the Category List menu item type. Once the Menu Item type is selected, we are automatically taken back to the Menu Item Edit screen. For Title, we type in the name of our category, for example 1 START UP. Below this there is a box to select the category we want to associate with this menu item. Click on the drop down arrow and choose the category 01 Start Up. As this will be a TOP menu item in the Main Menu, for Parent Item, we will leave the setting as Menu Item Root. Click SAVE and CLOSE to return to the Menu Manager for the Main Menu. Then click on VIEW SITE. When you click on a category list menu item, it will take you to a page which lists all of the articles which were placed in this category when the article was created. Here is an example of what appears when you click on the category list menu item called 1 STARTUP. Websites consist not just of text and images but also links to navigate between pages. When viewers visit your website, you can help them navigate between pages more easily if your Main Menu is set up like the Table of Contents of a book. The visible menu item links in the Main Menu are the chapter titles of the book and the hidden drop down menu items are the sections within each chapter. This article explains why the category structure in your Main Menu should match the category structure used to organize your articles and images. We also review the Joomla system for creating menu items and displaying articles - which is based on a key concept called Menu Item Types. 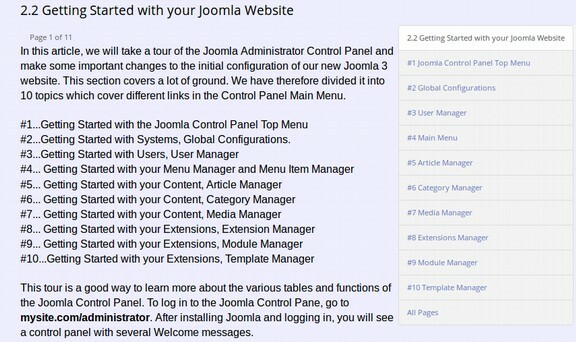 Joomla offers over two dozen menu item types. We will compare and contrast the most common options. Before we describe these various menu item link types, we first need to review the importance of using a single horizontal main menu. In Chapter 3.4, we touched on problems created for layouts by using multiple side menus. But there are additional reasons to use a single horizontal menu as noted below. Why use a single top horizontal menu? A multilevel horizontal menu is the most efficient type of menu. There are several reasons to organize your website with a horizontal drop down menu. The first is that your website viewers have been reading books their entire life. They are used to seeing a Table of Contents and having the content organized into Sections and Chapters and Pages. The Main Menu should be a Table of Contents near the top of every page of your website which your viewer can quickly scan through in order to understand the organization of your website and where they might be able to find a particular page or article they are interested in reading. Another important reason to use a single horizontal main menu is conservation of space. Unlike a book, the Main Menu for your website will and should appear on every page to help the viewer with Site Navigation. Also modern pages often have a Header Image at the top of the screen and a Multimedia Slide Presentation near the top of the screen. It is now common for the main area of the website to be taken up with not only text and images, but also videos and feature boxes which Joomla calls modules. In order to provide more room for content and images in the Content section of your webpage, the use of additional Menus in the Side Bar is declining. The Main Menu therefore is now commonly inserted as a Horizontal Menu between the Header and the Main Content Area. You therefore do not want the Main Menu to take up a lot of room or be too much of a distraction to the reader. The way to show all of your articles in a limited amount of space is to use a Horizontal “Drop Down Menu” in which all that appears on the opening screen are the BLOG and/or LIST CATEGORIES. Most of the actual articles are hidden until the viewer points their cursor over the Category. Pointing the cursor over the categories or clicking on the category displays the articles. In the next section, we will look at the 5 most common options for displaying articles. However, first we will review the general process for creating menu items in Joomla and briefly look at the most common “groups” of menu item types. As we discuss in more detail in the next article, the most common way to create a menu item in Joomla is to first write an article as we discussed in the last chapter. Then go to Menus, Main Menu and click on the big green New button. This will take you to the New Menu Item screen. The first task on this screen is to select a menu item type. To do this, click on the blue Select button. This brings up the Menu Item Type selection screen. 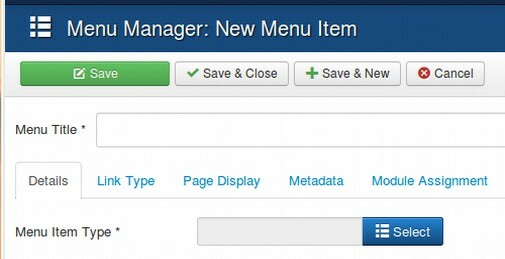 Joomla divides menu item types into eleven groups. Most of these groups we will never use. But it is nice to know they are there if we ever need them. The most commonly used category is the Articles group. Click on Articles to bring this up. 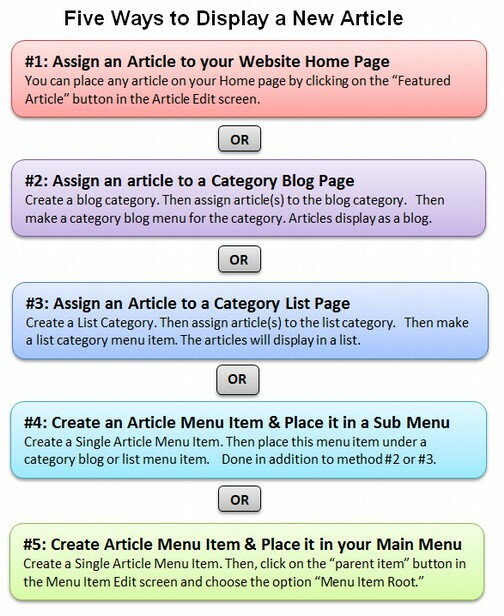 The most commonly used Article Menu Item types are Category Blog, Category List and Single Article. A Category blog is a display of articles with a single article introductory paragraph and optional image where all of these article introductions are on the same page with a READ MORE link to access the full article. A Category List is a Table with just the article titles. The Single Article Menu Item type is a menu item linked to the full article. This link can be either in the main menu or in a drop down menu below a category list main menu item. We will describe how to use these three important menu item types in the next section. 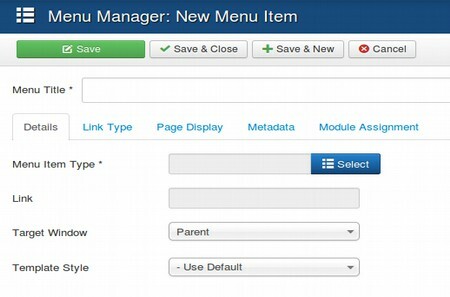 The next group of menu item types is called the Configuration Manager. There are two types in this group. But they are very rarely used as they provide access to pages which are better left limited to the Administrator Control Panel. The next group is called Contacts Menu Item types. The Contacts group can be used to display a list of contacts for a business or social club. However, you can better customize a Contacts page by using a special free Forms Component. We will explain how to create forms in Chapter 7. The next group of Menu Item types are called Newsfeeds. This is useful primarily for a site that focuses on the Latest News and wants to display the latest news from other sites which is automatically updated on a page which is linked from the Main Menu. The next type is a Search Form page link. This is for very large websites. There are two important menu item types in this group. The first is the External URL which you can use to provide a link to any page on the Internet – including a link to any page on your website. The other important menu item type is the Menu Item Alias. If you have a page that is so important that you would like to display a link to it in more than one place in your main menu, you can have the primary link assigned to wherever you want. But then you can also create a copy or alias of this link which you can assign to be displayed in another part of your main menu. Next are the Tag menu item types. This allows you to create tags for articles and display these tags which brings up pages associated with these tags. Sadly, the tagging system often winds up as a disorganized mess. Next are the User Manager Menu Item types. This allows you to display various User Menu Item types in a User Menu. 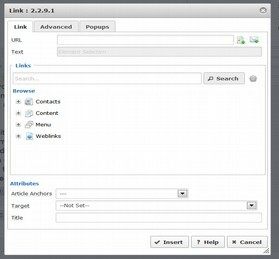 You can create a series of links to any pages and have them displayed in a well organized table. If you have a lot of links, they can be organized by category. The final menu item type is called Wrapper. It is a way to create a wrap around another website and then display that website page inside of your website. Once you have selected a menu item type, click on it to return to the New Menu Item Edit screen. The main screen will change depending on the menu item type selected. For example, if we select the External URL menu item type, the following New Menu Item Edit screen will appear. To create an external URL menu item, just give the menu item a title and copy paste the full URL link into the box provided. The link can be in the Main Menu or assigned to a drop down menu below any other Main Menu item (which is called a Parent Item above). You can also select whether the link opens in a new window or in the current window by using the selector to the right of Target Window. It is generally best to have external links open in a new window. So we will select New Window with Navigation. This way, when a person clicks on this menu item, they are taken to the new page. But they can easily get back to your website or click back and forth between your website and the externally linked website. Then click on Save and Close – or Save and New if you are making several menu items. Now that we know about menu item types, in the next section we will look more closely at the five most common menu item types.